PARIS --- Kuwait has signed an agreement with Italy to buy 28 Eurofighter Typhoon combat aircraft worth €7-8 billion, the first time the aircraft has won a contract in open competition. It also shows that the Eurofighter partners were right to invest in upgrading the Typhoon, despite foot-dragging by Germany and Spain. Signature of the final agreement is expected is a matter of weeks, as most of the details have been agreed and has been frozen by a Sept 10 agreement between Finmeccanica and the Italian ministry of defense, which in practice will buy the aircraft and supply them to Kuwait. The Italian government and Alenia-Aermacchi, the fixed-wing unit of the state-controlled Finmeccanica group, had been negotiating the sale for about three years, according to Italian sources, but the agreement’s signature comes as a surprise to many observers who saw Boeing’s F-18E/F Super Hornet as the leading competitor. Kuwait’s Typhoons will replace the earlier-model F-18A/B Hornets in Kuwaiti service. The Typhoon sale is one result of the long-term defense partnership that Italy has cultivated with Kuwait since Operation Desert Storm freed the country from Iraqi occupation. 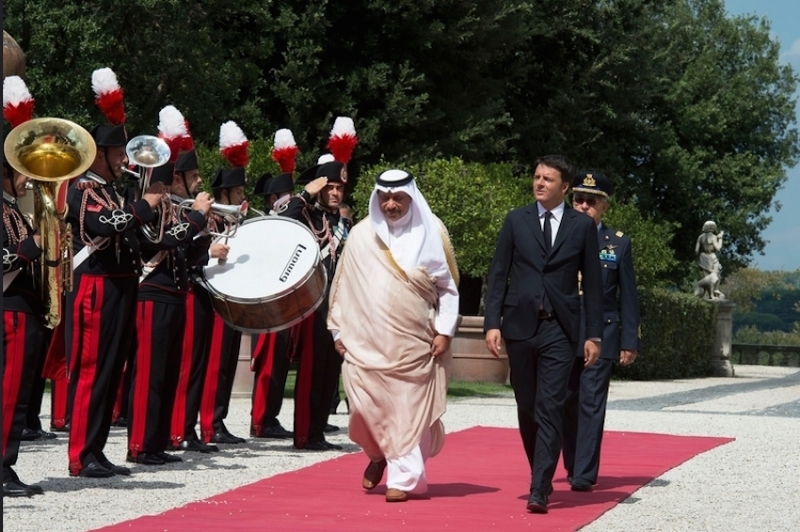 Kuwait has already outsourced to Italy its entire military pilot training process, from initial screening of candidates to their graduation, and the first class of 30 pilots will arrive at the Italian Air Force Academy next month. Italy also has deployed an Air Task Force to Kuwait since November 2014, as part of Operation Inherent Resolve, which currently includes four Tornado strike aircraft, 2 Predator UAVs and a Boeing 767 tanker stationed at Al Jaber air base. Italian Defense Minister Roberta Pinotti last visited the country in February. Kuwait will buy 22 single-seat and 6 two-seat Typhoons in a government-to-government deal guaranteed by the Italian government. The deal includes weapons, ancillary equipment as well as customer support for the next 20 years, which helps explain its high price. Some Italian media say that the deal means Kuwait will be the first to operate an AESA radar on the Typhoon, but this has not been confirmed. Delivery dates have not been disclosed. Italian media say that, as lead partner in the sale, Finmeccanica stands to win up to half of the deal’s value, or about €4 billion, the balance going to its Eurofighter partners Airbus Defence and Space and BAE Systems as well as to Paris-based MBDA, which will supply the weapons. The fact that Kuwait is buying only 28 Typhoons to replace its current fleet of 39 F-18 Hornets suggests either that it plans a follow-on order in the future, or that it intends to buy a second fighter from another source. The latter seems unlikely, however, because of the cost and complexity for a small country like Kuwait to operate two different fighter types. This is the third time this year that a Middle-Eastern country has turned to a European supplier to buy combat aircraft, marking their disillusionment with the United States which can only offer older aircraft like the Boeing F-18 Super Hornet and F-15 Eagle or the Lockheed Martin F-16. In the spring, Egypt and Qatar both bought Rafale fighters from France. The Kuwaiti contract is a crucial shot in the arm for the Eurofighter consortium, which was facing the prospect of winding down production by 2017 or 2018 as current orders were delivered. It also lifts any remaining doubts about the planned upgrade programs, which the four partner nations – Germany, Italy, Spain and UK – were reluctant to finance. Earlier this year, Eurofighter GmbH won a €200 million Phase 3 Capability Enhancement contract, and the partner nations are now working to define the next major upgrade contract, known as Phase 4 Capability Enhancement contract. In fact, the program’s prospects appeared dim after Airbus Group chief executive Tom Enders earlier this year said he was not very optimistic about the future of Eurofighter, but the Kuwait sale has given it new market credibility. This latest sale reverses a series of lost opportunities for Eurofighter, most recently last week when Indonesia said it would buy the Sukhoi Su-35S instead of accepting Eurofighter’s coproduction offer. The Typhoon was also eliminated by India after having been short-listed alongside the Rafale, as well as in Japan (which chose the Lockheed Martin F-35) and the United Arab Emirates, which has not yet decided its future fighter.